As far as states go, Arizona is still fairly young. It was on February 14, 1912 that Arizona was made the 48th state of the Union. It was the last of the contiguous United States to be made a state. Regardless, there is a lot of history to be found here. Connecting to the past and remembering where we came from is important. It helps us see how far things have come, and helps us to be thankful for what we have here and now. Wrigley Mansion– Yes, that Wrigley. The Wrigley Mansion was built in 1932 by the chewing gum mogul William Wrigley Jr. The mansion sits at the top of a 100 -foot hill, near the Biltmore Hotel in Phoenix, with amazing views of the surrounding mountains and the city below. The mansion incorporates California Monterey, Mediterranean, and Spanish architecture. Special events and weddings are often held at the mansion today. Tours of the home are available for those interested in the history of the home and the surrounding area. The mansion has a lunch/tour package that starts at $25 and individual guided tours that start at around $15. To learn more about each package, you can visit the Wrigley Mansion webpage. 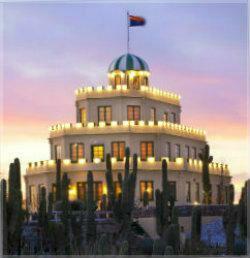 Mystery Castle– Located in Phoenix, Mystery Castle was created by Boyce Luther Gulley. Gulley began his mansion as a unique “sand castle” made of found objects and recycled materials for his daughter. He started the mansion in the 1930’s and continued to work on it until his death in 1945. The “castle” consisted of 18 rooms at that time. You can visit Mystery Castle from October through May, Thursday-Sunday from 11am-4pm. There is a tour fee of $10 for adults, and $5 for children ages 5-12. Unfortunately, Mystery Castle is not wheelchair accessible, and visitors will need to be able to climb a number of stairs. 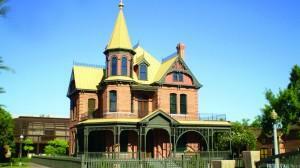 Heritage Square Phoenix– Visit the oldest remaining residential block in Phoenix! Heritage Square is a look back in to Phoenix’s Victorian past. The square dates back to the late 1800’s and is located on Block 14 of the original Phoenix town-site. There are ten fully restored buildings on site, with the crowned jewel being the beautiful Rosson House Museum. While you can visit the square anytime, individual buildings have their own hours and availability. For a small fee, the Rosson House Museum can be toured Wednesday-Saturday from 10am-3pm and Sundays from 12pm-3pm. St. Mary’s Basilica– This is the oldest Catholic Parish in Phoenix, and the second oldest church in Phoenix falling only behind the First Presbyterian Church (organized in 1879). Construction of the church at its present site began in 1880 under the supervision of Rev. Edouard Gerard. He was the first priest to be ordained in Arizona. According to its website, in 1902 the adobe church was in need of major repairs and enlargement. The current pastor, Fr. Novatus Benzing, O.F.M., received permission from his superiors to proceed with construction of a new church. The new church would need to be constructed in two phases due to budget constraints. The church was constructed in the Mission Revival style. The interior is in the Romanesque style. St. Mary’s was named a historic site by the Arizona Historical Society in 1976. On September 2, 1985, His Holiness Pope Saint John Paul II solemnly proclaimed the church of the Immaculate Conception of the Blessed Virgin Mary to be a Minor Basilica. Self-guided tours are available with a printable pdf containing pictures and detailed history of what it is you are looking at. Tovrea Castle– If you have lived in Phoenix for any amount of time, then you have seen the strange structure near East Van Buren and 52nd Street that resembles a wedding cake. This structure is Tovrea Castle and it has a deep and interesting history. A man named Alessio Carraro moved to Arizona in 1928 in hopes of developing the desert just east of Phoenix into a resort destination and housing subdivision. He would call the subdivision Carraro Heights. The focus of his design was a hotel, which is the structure still seen today. The building took fourteen months to build, and was completed in 1930. However, his dream was short-lived and he had to sell part of his property and the hotel in 1931. They were purchased by Edward Ambrose Tovrea. Tovrea passed away within a year, but his wife, Della, stayed in the castle until she passed in 1969. The castle was purchased from the Tovrea estate by the City of Phoenix in 1993. Tours must be booked in advance as they often sell out months in advance. Any “walk-in” tour requests will be based on availability only. There are no tours in July and August. Pueblo Grande–Located minutes from downtown Phoenix next to the Sky Harbor International Airport is the Pueblo Grande Museum. The museum is located on a 1,500-year-old archaeological site left by the Hohokam culture. It is the largest preserved archaeological site within Phoenix. It is open 7 days a week October through April, and closed Sundays and Mondays, May through September. A 2/3-mile trail leads you through a prehistoric Hohokam archaeological village site with a partially excavated platform mound, ball-court, and replicated prehistoric houses. According to VisitArizona.com, there are three galleries to visit while at the Museum. The main gallery displays artifacts of the Hohokam and discusses the Pueblo Grande village site. The children’s hands-on gallery has activities to help kids learn about the science of archaeology. The changing gallery features exhibits on various topics from archaeology, southwest cultures, and Arizona history. For authentic Native American gifts, art, and jewelry, the Museum Store has something for all tastes and budgets.